The problem of stress corrosion cracking (SCC), which causes sudden failure of metals and other materials subjected to stress in corrosive environment(s), has a significant impact on a number of sectors including the oil and gas industries and nuclear power production. Stress corrosion cracking reviews the fundamentals of the phenomenon as well as examining stress corrosion behaviour in specific materials and particular industries. The book is divided into four parts. Part one covers the mechanisms of SCC and hydrogen embrittlement, while the focus of part two is on methods of testing for SCC in metals. Chapters in part three each review the phenomenon with reference to a specific material, with a variety of metals, alloys and composites discussed, including steels, titanium alloys and polymer composites. In part four, the effect of SCC in various industries is examined, with chapters covering subjects such as aerospace engineering, nuclear reactors, utilities and pipelines. 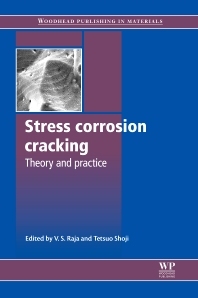 With its distinguished editors and international team of contributors, Stress corrosion cracking is an essential reference for engineers and designers working with metals, alloys and polymers, and will be an invaluable tool for any industries in which metallic components are exposed to tension, corrosive environments at ambient and high temperatures. Any industries in which metallic components are exposed to tension, corrosive environments at ambient and high temperatures. V. S. Raja is Professor at the Department of Metallurgical Engineering and Materials Science at the Indian Institute of Technology Bombay, India. Tetsuo Shoji is Professor at the Fracture and Reliability Research Institute at Tohoku University, Japan.